Last week, I was at a conference organised by the Natural Resource Governance Institute (NRGI), formerly Revenue Watch Institute, on the challenges and opportunities presented by falling commodity prices. It was attended by the best in the academia, in policy and in civil society in the field. A breakdown of the panels and speakers is available on the NRGI website. There were a couple of things which stood out that are worth highlighting and documenting. First, at the opening plenary, was……Professor Paul Collier’s scathing criticism of the EITI (Extractive Industries Transparency Initiative), the key institution for promoting transparency and accountability for natural resource revenues within resource-producing countries by the international community and civil society. 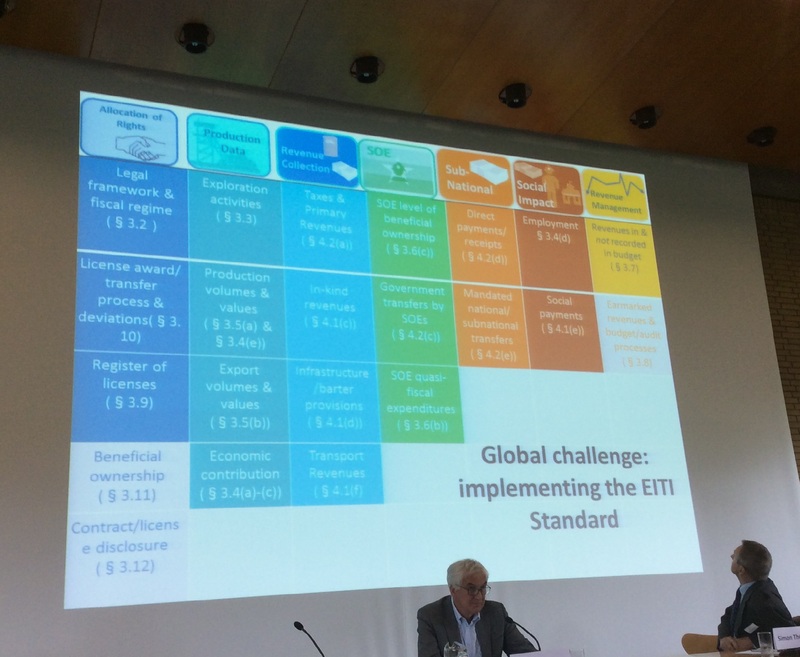 Collier said unequivocally that the focus on transparency and accountability especially the “EITI was the wrong focus… if you have just that and nothing else” this distracted stakeholders from more important governance objectives. This was quite controversial given that he was a key advocate of the EITI and there were several country representatives participating in the conference He supports his assertion with evidence from countries such as Ghana and Zambia, which had been diligently complying with EITI standards and are stable democracies, but had done poorly in the actual management and utilisation of these mining rents from gold, oil, and copper respectively. The key focus according to Collier should be on building an informed citizenry (such as Botswana) and building assets for the future. Although when I asked him during the Q&A session how democratically elected governments in these African countries are expected to build future assets through Sovereign Wealth Funds and long-term educational and infrastructural investments that do not yield immediate benefits, given the limited time horizon and competing demands they face, I didn’t get a very satisfactory response. Second highlight was the general dissatisfaction with the Norwegian model of managing resource wealth through Sovereign Wealth Funds, which have not been particularly effective among resource producers especially in Africa. Collier accused Norway of exporting its SWF model to Africa – the Africa section apparently is the fastest growing within the International Forum of Sovereign Wealth Funds. The concern was that governments were either establishing these Funds in the naïve expectation that it would address challenges of judicious revenue management, or that they were simply fulfilling requirements by donors and getting on with other ‘business’. As one panellist mentioned “SWF is not a magic bullet, during a downturn, countries need to set up strong revenue management institutions”. The third issue which caught my attention and which I’d like to investigate further is based on two presentations on decentralisation of resource wealth and sub-national governance in The Philippines and Indonesia. In both countries, administrative decentralisation has meant significant portion of oil rents are retained by the resource-producing regions with certain conditions that they save some of these revenues in dedicated Funds, and utilise the funds towards capital and social development projects based on special arrangements with the national government. It is a lot to think about for resource-rich African countries, especially Nigeria where much of the debate on decentralisation is yet to kick off and remains emotional, rancorous and centrifugal. Lastly, is the presentation by Albert Zeufack, Practice Manager at the World Bank on how the Democratic Republic of Congo (DRC) has been badly hit by declining commodity prices despite investing up to 50% of its revenues since 2010. In particular, his concluding statement on the need to invest in the political economy of fiscal rules, to investigate the elusive concept of ‘savings’ and in particular to investigate resource-financed infrastructure – popularised by China in its engagement with African countries – and understand it better was instructive. Coming from the World Bank, I would say this reflects a paradigm shift given that just a few years ago, the Chinese strategy of oil/resources-for-infrastructure deals were regarded with deep suspicion at best. To buttress the point he made is a recent World Bank publication on Resource-Financed Infrastructure as a New Form of Infrastructure Financing kindly sent to me by one of the authors. In a sense, like a recent OECD paper on State-Owned Enterprises (SOE) in the Development Process responding to the experiences of China, Brazil, India and other emerging powers’ successful utilisation of SOEs, it represents significant shifts within the development community on instruments and strategies popularised by emerging powers. 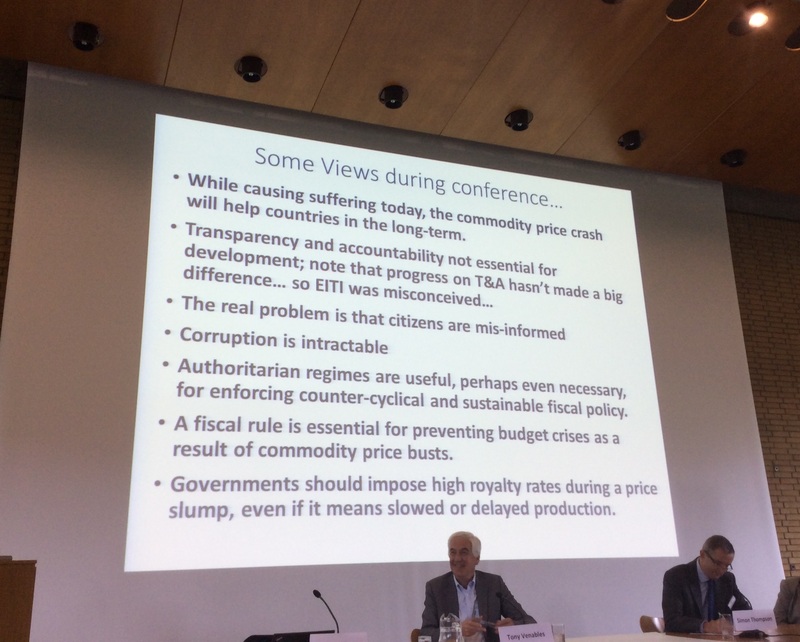 There were many other interesting bits including the panel on Nigeria and Ghana’s experiences with the downturn in commodity prices, a panel including Nuhu Ribadu, Nigeria’s former anti-corruption czar and Peter Eigen of Transparency International on whether such downturns provide an opportunity for fighting corruption etc. Videos of the sessions streamed live are available on the website. I’m sorry to say this Zainab but you’re quite a poor writer. Found on the Internet of Nigeria’s great news https://www.naij.com/ website Nigeria news. Here, unlike many corrupt and lying media, you’ll only the lattest and moest accurate information! Proven for years. This is not spam and not advertissing. The thing is, I like a man who is watching the news, tired of lies and want to shere with the truth!